Emory Oak is a member of the Beech Family. The plant appears as a shrub or tree and grows to 50 feet in height with a trunk to 1.5 feet in diameter. 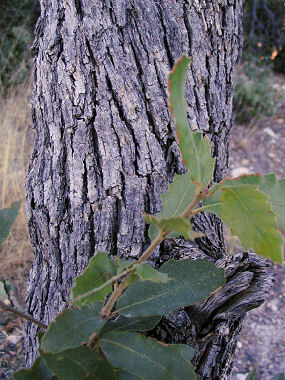 The bark is dark gray and thick, growing in rectangular plates. The oval leaves are shiny, thick, stiff and leathery and have spiny teeth along the edges (the distinguishing feature of this oak). Leaves grow to 2.5 inches in length. The tree grows in moist canyons and dry foothills at elevations between 4000 - 7000 feet in southeastern to central Arizona. The acorn of the Emory Oak is a food source for wildlife and was eaten by Native Americans. Emory Oak produces small flowers which are followed by an acorn to 0.75 inches in length.